Not only will you get to avoid the Monday blues on the golf course, but you can justify it by knowing your playing is a donation to Kansas’ aviation legacy. So hit the driving range as there is about a month to prepare for this four-person scramble at Willowbend Golf Course. To join, email Teresa Day or call 316-683-9242. Sponsorship opportunities are still available! Interested parties can email KAM Here for more pricing and registration information. The deadline to be included in print materials is April 27th, however, teams can sign up until the day before! At KAM guests can check out Wichita’s original municipal airport, walk the floors that Amelia Earhart, Charles Lindbergh, and Howard Hughes walked. 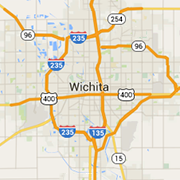 Learn about the rich history of aviation in Wichita, and why it is the Air Capital of the World. Experience what it is like to fly on one of our computer simulators in our Boeing Science, Math, and History Learning Center, climb and slide on our indoor playset in our Lattner Learning Hanger. Walk among historic aircraft both inside and out on the ramp. Learn about the 4 forces of flight, create crafts and memories through guided educational tours, and even dine and dance in the atrium at your next event.